1. As part of the University of Alaska at Anchorage Low-Residency MFA Program, all us faculty gave public readings almost every night of the program. Everyone in the program attended these readings--usually, all the faculty and all the students, which I think was something like 60 people total though I'm not sure...--as well as a bunch of people from the community. It was a very cool, unique experience. Here is a podcast of it. By the way, Craig's latest book, Finders Keepers: A Tale of ­Archaeological Plunder and Obsession, just came out, and here's the NY TImes review. Many of the other readings, by the way, were spectacular. I became quite close to the poet Anne Caston while I was there, and her reading absolutely knocked me out and had me in tears practically the whole time (she is devastating, amazing, and she reads in this soft, sweet, hushed voice, and the most heartwrenching things come out of her mouth... I felt like I was listening to someone out of Greek myth...). She read with Rich Chiappone, who is unbelievably funny--what a combination, those two!--and then Sherry Simpson ended that night with a reading from her new book about bears, which was really lovely and sad and eye-opening. Anne and Rich's readings are here, and Sherry's is here. And of course there was Jo-Ann Mapson, who is this incredibly charming, wonderful storyteller (her 10th novel, Solomon's Oak, is about to come out) and wonderful lady, and I will love her forever for plucking me up and bringing me to Alaska in the first place. 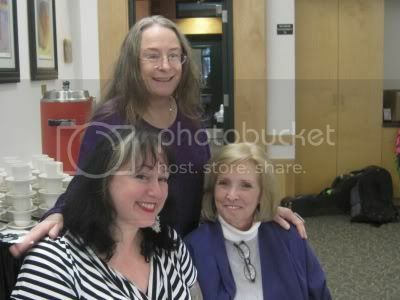 I became close to a lot of people in Alaska, but Jo-Ann and Anne really made the experience warm and lovely for me. The three of us went out to lunch on the first day of the program and again on the last, and I miss them! Anyway, Jo-Ann read with Judith Barrington and program director David Stevenson, both of whom are wonderful but if I keep saying that word I am quite sure something bad will happen to me; the link is here. There were many other great readings and they are all on podcast on that same site (include Kim Addonizio's, which I mentioned before).... I have not listened to any to any since I was there, and have not listened to my own because I would surely faint away and die. But you should listen, this minute! 2. I must ALSO mention the anthology of fairytale stories which I am roodly NOT IN but which Kim Addonizio is in and the amazing Timothy Schaffert is in (amongst may others), My Mother She Killed Me, My Father He Ate Me: Forty New Fairy Tales, which comes out next month. Timothy, whom I met a couple times in Omaha, the first time during his literary festival there, which was so much fun, emailed me to ask if I would join him and Terese Svoboda in a conversation about mermaids for the Prairie Schooner blog. (That will happen in a month or so I think). He said that his story in the anthology is called "The Mermaid in the Tree" and is also a based on "The Little Mermaid" and I demanded that he send it to me right then and it is totally, totally stunning and weird and gorgeous and macabre and AWESOME. Desiree, however, was less inclined to be enthused, and she climbed from the hole, distracted, to light a cigarette on the flame of the lantern. She uncorked a jug, gulped down a few fingers of whiskey, and squinted at the horizon of plains burnt black by old prairie fires, the setting sun leaving behind a thin ribbon of violet. His heart isn’t mine, she thought. Admit that is one of the best openings ever. AND WHERE HIS GHOST CONTINUES TO HAUNT THE LANDSCAPE. I love this city, and love all the fabulously decadent and elegant events like Boheme Sauvage, which I'd been to last fall and which I went to again on Saturday. I will post photos later, of that and all kinds of other things, but for now here is a little video I took of Coco, the host, tapdancing furiously and gorgeously in front of the decked-out crowd. I first met this boy at his "Oskar Wilde party" last fall, where he read "The Selfish Giant" to a room full of guests sitting around a super-decadent candelabra and rose petal covered long table. I believes I just sat there struck down with awe.